With Summer finally in full effect, is there anything that sounds better than grabbing a refreshing cocktail after a day in the sun? It has long been known that staying aligned with your fitness goals can be affected greatly by alcohol, but that does not mean there aren’t ways to enjoy your nights out while still being health-conscious. We teamed up with The Wilder Restaurant and Bar, located on Fleet St. to bring members a guilt-free cocktail that we’ve named the MISSION Mule. Stick around below for a members-only special deal! Although calories can add up, one of the bigger concerns with many cocktails is their sugar content. There are many people who try to limit their intake of sugar by cutting soda or using artificial sweeteners in their coffee, but go out and you’ll end up consuming double the sugar because of the sugars that lie hidden within the drink menu. Added sugars are the largest supplier of empty calories to our diet, which means they offer no nutritional value, and those calories add up fast. One of the easiest ways to cut sugar and calories without too much impact on flavor, is to opt for water or soda water, instead of mixers like soda and sugary juices. You can also ask the bartender if fresh-squeezed juices are available. Lemon and lime are a great way to add refreshing flavor without the calories, and fresh squeezed grapefruit juice would be a great nutritional additive that supplies flavor along with some health benefits. Palomas are a mix of tequila, grapefruit juice, club soda, and lime, and they’re a health-conscious switch from something more calorie-heavy, like a margarita. Staying away from items with chocolate syrup, salt, or sugar around the rim, and cream bases is an easy rule-of-thumb. Your alcohol choice also plays a role. Mixing multiple varieties of alcohol puts more stress on your body to detox your system, so rather than choosing something like a Long Island Ice Tea that contains 4 different alcohols, keep it simple! Blanco tequila, like Corazon, is a 100% agave tequila but opting for a lower quality tequila can mean you are drinking a significant portion of fermented sugar. Pure varieties of alcohol will have no carbs and lower sugar, but beer and wine are more indulgent choices, in regards to both carbs and sugar. Communicating with your bartender to find out where the flavors in your cocktail are coming can make modifying your drink much easier. They know where the sugar and calories in your order are coming from, and asking them how they can cut powders or syrups without sacrificing the taste, is easier for them than it might be for you. 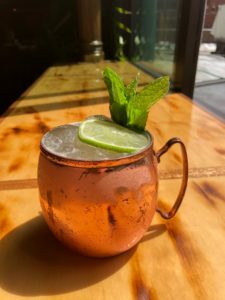 At The Wilder, the Moscow mules are made with a ginger syrup, which is half fresh-pressed ginger. This is unique, cuts the sugar significantly, and it also gives the benefits of fresh ginger from both a taste and health perspective. Their creative drink menu got our attention at both their location in Portsmouth, and at their sister restaurant, The Wallingford Dream in Kittery, ME. MEMBERS-ONLY SPECIAL: We designed our very own cocktail, the MISSION Mule, and you can grab yours for just $5 at both The Wilder and The Wallingford Dream. A combination of vodka, their house ginger syrup, some fresh lime juice, and soda water gives you all the pleasure of a traditional Moscow mule, with less than half the sugar and calories. The MISSION Mule gives you an easy way to get your drink on, without the guilt. Visit them and enjoy this fit-friendly cocktail soon!